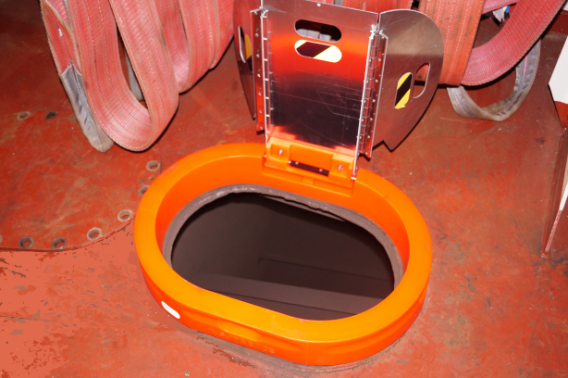 SafeEdge is a protection cover that prevents falls and other injuries associated with open manholes on-board vessels and platforms. The product is specifically designed to allow ventilation and utilities to remain accessible while still covering the hole and protecting the crew. SafeEdge was initially developed after a design student saw the need for a standardized method for securing open manholes, as the industry had not yet found a successful approach that would cover all safety requirements. The numerous interpretations, from the industry, shaped the first prototype of SafeEdge, but have since then been redesigned and improved to become more functional. The new SafeEdge has been well embraced by management and crew on-board vessels and platforms. 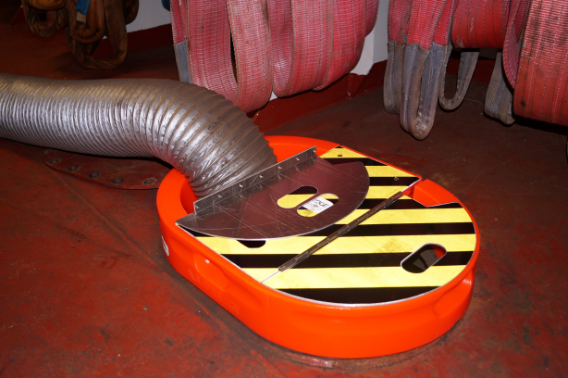 The SafeEdge SE65 is designed to fit the most common model of Norwegian Standard (NS) 6261 – 6263 (ISO 5894) inspection hatch cover. Any vessel no matter size, form, or geographical area can fit this product as long as it has manholes that conform to these standards above. We will in due course increase the range of sizes to the SafeEdge product range. At 18 lbs., safely under Health and Safety requirements, the SafeEdge is a risk-free product to handle for workers and crew. The base has also incorporated handles so that carrying, and installation will be easier. With SafeEdge there is one less, unnecessary, hazard that threatens the safety on deck. They had very good reports from the vessel and everyone was very happy with SafeEdge. and I cannot believe that I haven’t seen it before. We have confidence that this will be a standard product at Norwegian shipyards. Highly recommend SafeEdge to all the vessels. We have SafeEdge in use in our yard because we believe it is the best product on the market to prevent falls and increase safety.